It was a little less hectic than expected, but it appears that a few deals were completed today. Early in the day, Carolina shipped forward Matt Cullen to the Ottawa Senators for defenseman Alexandre Picard and a second round draft pick. The Senators were looking for more scoring depth. Cullen is a very capable third line and face off man, but not sure that he is everything that Ottawa needs. Picard had been squeezed out with the Sens and will get a chance to develop with the Canes. Later TSN reported that Chicago and Minnesota struck a larger deal. 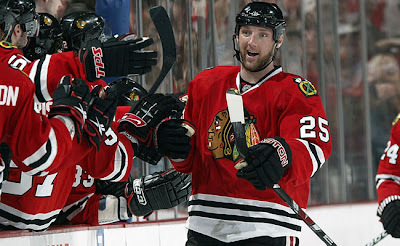 The Blackhawks send defenseman Cam Barker to the Wild for defenseman and impending UFA, Kim Johnsson and 2009 first round pick, Nick Leddy. As everyone knows, Chicago will need to clear cap space for next season. Barker, who is in the first year of a three year, $9.25 million deal almost had to be moved. In return the Hawks receive a strong, rental replacement in Johnsson and a top prospect for the future. Because of Chicago's deep blueline, Barker was pushed further down the depth chart than his skills might suggest he should be. In Minnesota he will be given every opportunity to shine, as the Wild now have a top four defenseman locked up at a moderate price tag for the next couple of seasons. Everybody wins here. TSN also reported that "The San Jose Sharks have traded forward Jody Shelley to the New York Rangers in exchange for a sixth round draft pick." It would seem that the Rangers feel Shelley is more able to perform the duties of disgruntled enforcer Donald Brashear. However, at a lower cost. We are told that Sean Avery helped sell this deal to GM Glen Sather by reminding him not to discount the importance of Shelley's "made for Wall Street" hairdo.